When I was asked to be a presenter on Year of Ceremony with Sounds True I had no idea that their team would assign me a very special moon indeed: the Full Moon of January 2018 is the Super Blue Blood Moon and there is also a total lunar eclipse. I will start by sharing some scientific and astronomical information with you to explain how special it is and why! The last time these same major events lined up was 150 years ago!! If you felt that the Super Moon on New Year’s Day in January 2018 was special – take a deep breath: on January 31st, around midnight, the full moon will not only be super – it will also be a Blue Moon and a Blood Moon. The name Blue m refers to the second full moon in a calendar month. That happens every two and a half years, hence the saying “once in a blue moon”. Things get even better: these two celestial events, the blue moon and the super moon, will also coincide with a total lunar eclipse! With Earth in between the Sun and the Moon, sunlight has to pass through the Earth’s atmosphere, which scatters the green to violet light more than it scatters the red light. So the Moon appears red – a blood moon. NASA has given this Moon the name of this article: The Super Blue Blood Moon! Most people here will be aware that Full Moons have special effect on us: for instance Accident and Emergency departments of hospitals are busier than usual. Super Moon means that the Moon is at the point in her orbit where she is closest to Earth. Some people believe that the Blue Moon is a time of heightened clarity and connection to the Divine. Any magical work done (or indeed any ceremony performed) will receive a boost that night! With all of these events going on – think of the boost for the ceremony I was asked to present! Year of Ceremony was visioned to be an online monthly shamanic group that brings together the leading shamanic teachers and practitioners on the planet. “We live in a time when we are called to truly connect—to each other, to nature, and to our own deeper purpose. As we face unprecedented challenges in our modern age, each of us will have the chance to become a source of light and healing in our world. More people are turning to shamanism every day. Why? It is a beautiful project! I am writing this article before the Big Event but next month I hope to write about how it went and what our audience discovered. Also: there will be a surprise on the night – but I am not going to give away what the surprise is! Imelda Almqvist’s book Natural Born Shamans: A Spiritual Toolkit For Life (Using shamanism creatively with young people of all ages) was published by Moon in August 2016. She is based in London,UK and teaches shamanism and sacred art internationally. She is a presenter on Year of Ceremony for Sounds True and on the Shamanism Global Summit with The Shift Network. An eclectic group of women in my area have been getting together for as many full moons as possible these past two year. One of our favorite traditions grew out of our coven – to gather at a small public beach that does not close at sunset. We bring blankets, camp chairs and food, and set up where we see the sun set behind the cottages and then watch the moon rise in the east over the water. We do it as often as possible when the full moon falls on a weekend during warm weather. The most recent time was June 9, which happened to be the Strawberry Moon. An informal, impromptu ritual included directional candles set up on a blanket and a fertility goddess. We chanted. One woman bought her singing bowl to bring us all into harmony. We all raised strawberries to the moon along with our petitions and gratitude. There was raucous laughter and deep silence, and conversations both magickal and mundane. We dipped our toes in the ocean under the moon. We hugged and kissed and allowed our wild women selves to come out. Perhaps these photos of that night will prompt you to have an equally awesome and awe-filled experience. The moon is usually seen as a female symbol, and was worshipped in ancient times as a powerful force through most cultures. It is believed to be linked to the unconscious, our psychic and feminine side. The sacredness of the moon has been connected with the basic cyclic rhythms of life. The changing phases of the moon were linked to the death and rebirth seen in crops and the seasons, and the monthly cycles humans go through as well. The moon calendar is still as important today as it was in ancient times, and the prudent Pagan/Witch/Heathen works her/his magic according to the moon and her cycles. Full moons occur from fourteen to seventeen-and-a-half days after the new moon. 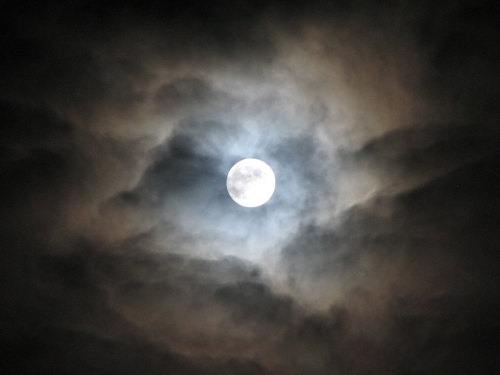 Full moons are prime time for rituals for prophecy, protection, divination. Any workings that needs extra power, such as help finding a new job or healing for serious conditions, can be done now. Also, full moons aide work for love, knowledge, legal undertakings, money, divination, and dreams. It is said that full moon magic is like a white candle — all purpose. Full moon magic can be conjured during the 3 days prior to the rise of the full moon, the night of the full moon and during the 3 days after. Between the full moon and the dark moon is the period of waning moon. The waning moon is best used for banishing and rejecting those things that influence us in a negative way. Negative emotions, diseases, ailments, and bad habits can all be let go and special spells for clearing can be performed at this time. Saging your home is a great idea during this time. From three-and-a-half to ten-and-a-half days after the full moon.The waning moon is used for banishing magic, for ridding oneself of addictions, illness or negativity. The new moon is for starting new ventures, new beginnings. Also a good time for love and romance, health or job hunting, anything that is for personal growth, healing and blessing of new projects or ventures. The new moon is also a good time to cleanse and consecrate new tools and objects you wish to use during rituals, ceremonies or an up coming festival or something you just obtained. Some people call the new moon the dark moon and the terms are often interchangeably used. New moon workings can be done from the day of the new moon to three-and-a-half days after. The first quarter, called the waxing moon is best used for attraction and constructive magic, love spells, wealth, success, courage, friendship, luck, and healing energy. Between the new and full moon from seven to fourteen days is a period of the waxing moon. The full moon nearest to the Autumn Equinox is called the ‘Harvest Moon’. In two years out of three, the harvest moon comes in september, but in some years it occurs in october. At the peak of harvest, farmers can work late into the night by the light of this moon. This is because for several nights it appears large and bright in the early evening, bringing farmers valuable extra time to gather in their harvest. Usually the full moon rises an average of 50 minutes later each night, but for the few nights around the Harvest Moon, the moon seems to rise at nearly the same time each night: just 25 to 30 minutes later across the U.S., and only 10 to 20 minutes later for much of Canada and Europe. Corn, pumpkins, squash, beans, and wild rice the chief Indian staples are now ready for gathering. However, The full moon in october is called many different names throughout the world. Other october full moon names include: Shedding Moon, Winterfelleth (Winter Coming), Windermanoth (Vintage Month), Falling Leaf Moon, Ten Colds Moon, Moon of the Changing Season, and most famously, Blood Moon. The Festival of Ciuateotl, the snake woman goddess, celebrated among the Toltecs and Aztecs. During the full harvest moon, the Aztecs and Toltecs appeased the Goddess of strife, misfortune, and labor whose name means ‘the great bath of sweat’. The Disirblot of Freyja, Norse Goddess, marked the begining of the Winter season. On this night, great family feasts were held which featured foods sacred to the Autumn deities. Whatever container or vial you plan on using make sure it is clean and has been sitting in the full moon to gain it’s energy. This oil can be used on candles, in an oil burner, or in a sacred bath prior to your full moon celebration. *Note: I have worn this as a perfume, but before you do this make sure you aren’t allergic to any of the ingredients.